A super sharp display, Haswell chip and gorgeous flexible design make this ultrabook easy to recommend despite its lackluster lasting power. 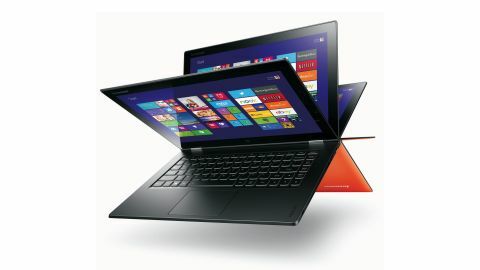 Lenovo has been breaking ground in the convertible ultrabook world with its Yoga line. In our Lenovo IdeaPad Yoga review we found ourselves surprisingly pleased with this versatile hybrid laptop and its solid performance. Even if we didn't use the Yoga as a tablet, we often flipped the keyboard back to poke through Windows 8 live tiles or watch some Netflix. What we didn't like were mostly minor complaints. The keyboard, the trackpad, and the screen were all winners. The absence of a backlit keyboard was a mild annoyance, while the lack of a true 1080 display was a read missed opportunity. At the time, we also expressed concerns that the Yoga was actually exposing some of Windows 8's weaknesses. With the Yoga 2 Pro Lenovo produced a noteworthy refresh to a device that increasingly looks like it will be a mainstay of the PC maker's lineup for the foreseeable future. A 3200 x 1800 display (known as QHD+, or WQXGA for the truly in the know) is the most significant enhancement, but the new hybrids also have a Haswell processor, some subtle enhancements to the chassis, and a few extra touches in the bundled software. All things considered, these are all welcome enhancements, although once again, Lenovo's forward-thinking design exposes some surprising flaws in Windows 8's ability to handle super HD resolutions on a portable form-factor. What could possibly be bad about a QHD+ 3200 x 1800 display? We'll get to that in good time. For now, let's start at the top. One final note before we dive in: there aren't a great number of competitors in the super high-resolution ultrabook category. The Samsung Ativ Book 9 Plus is one—it sports near-identical specifications to the Yoga 2—and the 13-inch MacBook Pro is another. Both cost 40% to 50% more than this system. As the saying goes, you don't fix what isn't broken. In addition to its unprecedented flexibility, the original Yoga's sleek, rubberized chassis was one of the laptop's most remarked-upon attributes. Thinking clearly, Lenovo has changed barely a thing, aesthetically speaking. Part of the joy of reviewing this new Yoga Pro 2 was putting it in people's hands. Everyone remarked on its nice it look and feel, thanks to a thin profile, sturdy chassis, and that grippy, rubberized surface that we mentioned, which coats the entire device. Just like last year, the most striking and still unique aspect of the Yoga 2 Pro is the fact that you can flip the screen back 360 degrees until it rests flat against the backside of the keyboard. This permits four operating modes. Laptop mode is your standard 90-degree angle, with the advantage that the Yoga 2 Pro's flexible hinge allows you to lay the screen completely flat, which is actually quite handy for situations where you're standing up and need access to the keyboard. The most useful mode next to laptop mode would be tent mode. By setting the tablet on its top and bottom edges, the devices functions like a tablet in a stand. The new rubberized bevel edges earn their keep in this mode. The old Yoga would sometimes slide a bit on slippery surfaces. Not anymore. It's perfect for glancing at a recipe while cooking or setting the Yoga 2 Pro up on cluttered tablet tops. Stand mode is essentially tent mode, but with a little more sturdiness and support. The key difference is that it has a bigger footprint, so you'll need to clear off more of your desk before touchdown. A special hinge on the Yoga 2 allows you to fold the screen all the way back for tablet mode. Unfortunately, just like the original Yoga, the 13-inch Yoga 2 Pro is a little too large to use comfortably in tablet mode. Also a repeat of the original: the presence of the keyboard on the backside of said tablet is obstructive and annoying. This said, the notion of playing full-fledged, touch-optimized PC games like Civilization V in this mode is fairly joyous, even if the device is too heavy to hold in your hands.